Did you know that the online education industry is slated to push past $275 billion by 2022 (according to Reuters)? We're seeing opportunities for entrepreneurs teaching online expanding every day - and I don’t want you to feel left behind. It’s the right time to create an online course business, learn the ropes, and establish your authority as an expert in 2019. To fast-track your success with online courses, we’ve developed a special one-day workshop for anyone looking at growing a business with online courses this year. Online modules can be used as an effective way to structure and deliver teaching and trainings. Designing good online module requires skills such as choosing the platform, structuring the content and using appropriate tools to design engaging learning activities (including assessments). This course will focus on a systematic approach for a rapid and simple creation of online teaching/training module in which an interactive learning environment is effectively fostered. You will learn how to convert your face-to-face class into a robust online module. Get the Blueprint to creating and selling a successful online course now! Venue: PIPPA Seminar Room, Level 1, Eureka Complex, Universiti Sains Malaysia. The fee is RM300.00 per pax. The cost is inclusive of morning break, lunch and training materials. The cost excludes accommodation and traveling for participants. Number of participants will be limited to 25. 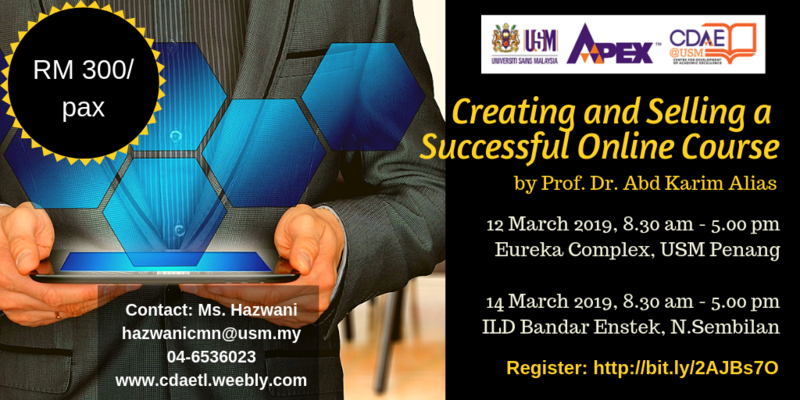 Please email Puan Hazwani​ / Puan Norliza for any query about this course.